America has always been a land of contradictions. At the very least we could say the nation’s history has featured the sometimes creative, sometimes destructive interplay of certain tensions. At least one of these tensions can be traced right back to the earliest European settlers. In New England, Puritans established a “city on a hill,” a community ordered around the realization of a spiritual ideal. Further south came adventurers, hustlers, and entrepreneurs looking to make their fortune. God and gold, to borrow the title of Walter R. Mead’s account of the Anglo-American contribution to the formation of the modern world, sums it up nicely. Of course, this is also a rather ancient opposition. But perhaps we could say that never before had these two strands come together in quite the same way to form the double helix of a nation’s DNA. This tension between spirituality and materialism also overlaps with at least two other tensions that have characterized American culture from its earliest days: The first of these, the tension between communitarianism and individualism, is easy to name. The other, though readily discernible, is a little harder to capture. For now I’m going to label this pair hustle and contemplation and hope that it conveys the dynamic well enough. Think Babbitt and Thoreau. These pairs simplify a great deal of complexity, and of course they are merely abstractions. In reality, the oppositions are interwoven and mutually dependent. But thus qualified, they nonetheless point to recurring and influential types within American culture. These types, however, have not been balanced and equal. There has always seemed to be a dominant partner in each pairing: materialism, individualism, and hustle. But it would be a mistake to underestimate the influence of spirituality, communitarianism, and contemplation. Perhaps it is best to view them as the counterpoint to the main theme of American culture, together creating the harmony of the whole. One way of nicely summing up all that is entailed by the counterpoints is to call it the pursuit of the simple life. The phrase sounds quaint, but it worked remarkably well in the hands of historian David E. Shi. In 1985, right in the middle of the decade that was to become synonymous with crass materialism – the same year Madonna released “Material Girl” – Shi published The Simple Life: Plain Living And High Thinking In American Culture. The audacity! This net gathers together Puritans and Quakers, Jeffersonians and Transcendentalists, Agrarians and Hippies, and many more. Perhaps if Shi were to update his work he might include hipsters in the mix. In any case, he would have no shortage of contemporary trends and movements to choose from. None of them dominant, of course, but recognizable and significant counterpoints still. If I were tasked with updating Shi’s book, for example, I would certainly include a chapter on the critics of the digital age. Not all such critics would fit neatly into the simple life tradition, but I do think a good many would – particularly those who are concerned that the pace and rhythm of digitally augmented life crowds out solitude, silence, and reflection. Think, for example, of the many “slow” movements and advocates (myself included) of digital sabbaths. They would comfortably take their place alongside a many of the individuals and movements in Shi’s account who have taken the personal and social consequences of technological advance as their foil. Thoreau is only the most famous example. Setting present day critics of digital life in the tradition identified by Shi has a few advantages. For one thing, it reminds us that the challenges posed by digital technologies, while having their particularities, are not entirely novel in character. Long before the dawn of the digital age, individuals struggled to find the right balance between their ideals for the good life and the possibilities and demands created by the emergence of new technologies. Moreover, we may readily and fruitfully apply some of Shi’s conclusions about the simple life tradition to the contemporary criticisms of life in the digital age. First, the simple life has always been a minority ethic. 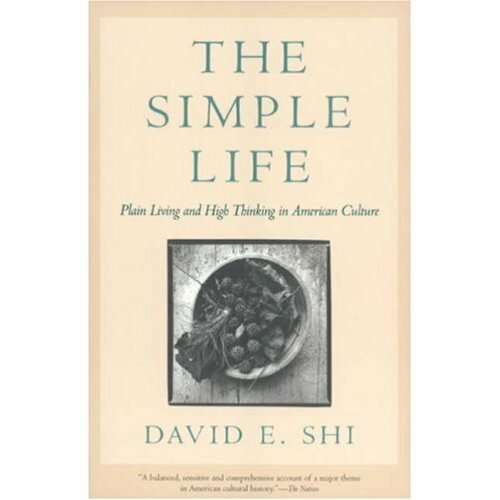 “Many Americans have not wanted to lead simple lives,” Shi observes, “and not wanting to is the best reason for not doing so.” But, in his view, this does not diminish the salutary leavening effect of the few on the culture at large. But it is important to remember that the simple life at its best, now as ever, requires a person “willing it for themselves.” Impositions of the simple life will not do. In fact, they are often counterproductive and even destructive. That said, I would add, though Shi does not make this point in his conclusion, that the simple life is perhaps best sustained within a community of practice. Wisely, Shi also observes, “Simplicity is more aesthetic than ascetic in its approach to good living.” Consequently, it is difficult to lay down precise guidelines for the simple life, digital or otherwise. Moderation takes many forms. And so individuals must deliberately order their priorities “so as to distinguish between the necessary and superfluous, useful and wasteful, beautiful and vulgar,” but no one such ordering will be universally applicable. Nathan Jurgenson has recently noted that criticisms of digital technologies are often built upon false dichotomies and a lack of historical perspective. In this respect they are no different than criticisms advanced by advocates of the simple life who were also tempted by similar errors. Ultimately, this will not do. Our thinking needs to be well-informed and clear-sighted, and the historical context Shi provides certainly moves us toward that end. At the very least, it reminds us that the quest for simplicity in the digital age had its analog precursors from which we stand to learn a few things. Another post of sanity, Michael particularly timely from my point of view. Having just returned from the mania of motion and over-scheduling and over information processing that was the UN Rio + 20 Conference, I seemed to have returned to myself and my own notion of simplifying my own life. This is in particular because of what I observed was a massive amount of committed and sincere human time gathered to re-think the path of sustainable development on this planet result in little or no officially positive outcome — the “Outcome Document” by UN member states being a singular disappoint of any significant outcomes despite the acknowledged legitimacy and urgency of the environmental crises and the sincerity of so many gathered there to deal with these crises. Yet what was reinforced, especially in seeing the work of the slum “favelas” in Rio with their own community solutions, was the power and force of community problem-solving where governments, owned now by corporations, refuse to act. There is a great “simplicity” and empowerment in that, just as there is in weeding one’s own garden, cleaning up/reducing one’s own material possessions and simplifying one’s own life. I returned with an actual longing for that as if for a long neglected human need. Your post, and this book by David Shi I will now look for, seemed to echo and reinforce that desire. Despite all the stress of the digital cacophony, maybe sometimes it is as simple as trying to live one’s own life more simply and with a greater sense of reverence and appreciation for that simplicity. It’s always nice to be reminded of that in a way that actually may help one do exactly that, as life is indeed such a fragile and preciously short moment for us all. Thanks. June, Thanks for this comment and the connections you drew. While personal acts of simplification may not solve all of our most pressing problem, I agree that it is certainly a beginning and not an insignificant one at that. Thank you, Michael, for this breath of fresh air. Choosing. Every day in every way. Slowing down and refusing to be mastered by the whiz-bangers can, I believe, make an impact upon all our relationships. Real eye contact is another way to meaningfully connect with others. Sometimes, it is the smallest things that make life real and social change possible. Faith can move mountains–perhaps, grain by grain. And, I’m grateful for people like you with your blog and for people like Sue Gorman who keep trying to work with the global community even when it seems fruitless. Prayer is my service, and you will both be in my prayers. Arlene, Thank you for your kind words and your prayers.